Maro Malaga - Getting from Malaga airport to Maro. Maro is a small locality of roman origin that belongs to the municipality of Nerja in the province of Malaga. Nowadays it’s mainly agricultural although its tourism has increased due to its proximity to several places of interest and to its well-known natural beaches. As far as it is known, Maro was a small hamlet or factory dedicated to the trade during the Roman period. Later on with the Muslim dominion, Maro became a small village dedicated to agriculture, mainly cultivating the sugar cane. The Christian armies’ conquest around the year 1487 and the subsequent expulsion of the moors brought the entrance of their beliefs and the popular folklore. Just for the record, there is evidence of the visit of the Cardinal Cisneros to this area, who slept in a fortified tower, where today the ‘Casa Grande’ is located. One of the most prosperous periods in Maro took place during the 19th century, due to the exportation of its fruits. In Maro we’ll find the ‘Rio de la Miel’ (river of honey), underwater grottos and caves, picturesque paths and trails that we’ll be able to perambulate whilst we enjoy its wonderful views. The typical dishes in Maro are related with the fish of this area and the tropical fruits. We recommend you to try the ‘Encebollado de Atún’ (a dish of tuna with onions), the ‘Parrilladas’ (a mixture of grilled food) y the ‘Frituras’ (a mixture of fried fish). 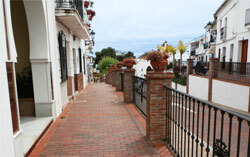 You can get to Maro in about 50 minutes (70 km) from Malaga airport. If you need a car you can check out our car hire prices to get from Malaga to Maro in the most comfortable way. Another option is a Malaga airport transfer to Maro. Town council: C/ Puerta del Mar, 2 - 29780.